For a branded calendar that won't take up much space on the desk, choose the Smart Calendar - Micro Case. This little calendar contains 13 sheets of white paper, and each sheet is printed with either bespoke or pictorial inserts on one side. The calendar comes packed in a mail-safe carton so you can send it out to your customers as part of a promotional drive. 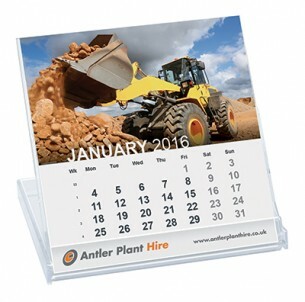 This calendar is printed using litho or digital print. Print area 80 x 8mm. Pantone colours are approximate and may vary from batch to batch. Please contact us if you require matching to a specific pantone colour. The number of colours in your logo or artwork will change the price of this product. We can only print solid ‘block’ colours using our usual print process (screen printing). Please select the number of colours which match your logo or artwork. Examples are provided below. Full colour printing (for artwork including gradients, shadows and images) is only available on ‘Dye Sublimation’ or ‘Full colour’ products. Please search for the appropriate item above if you’d like to print using this process. We can redraw your artwork into fewer colours if required, just send a message or an enquiry mentioning this in a comment.